There’s no doubt that Razor is the world’s favourite scooter. In fact, they’ve sold a whopping 34 million of them. With a passion for re-invention, the gurus in two-wheeled-fun have some sweet new twists that will see you shredding, cruising and spinning in style this Autumn. From the classics to the latest wild release, Razor makes the coolest and best scooters for kids, hands down. Razor believe ‘fun is forever’ and boy do they deliver on their promise! For almost 20 years they’ve been the most trusted and innovative scooter brand around, yet somehow they keep on keeping it fresh, year after year. At Mum Central we’re big Razor fans. So we’re super excited to share with you our picks of the hottest new models, and (even better) give you the chance to win them for your kids! Just like a juicy burger and chips, sometimes a classic can’t be beaten. Dialling it back to where the fun began, the Razor Kick Scooter is the reason the two-wheeled-craze ever started. The Razor Kick Scooter is bang for buck at just $59 and jam-packed with features including adjustable handlebars, aircraft-grade aluminium construction, a patented folding mechanism (and much more!). Best of all, it’s easy to fold, carry and ride – and no assembly is required. The Kick Scooter is not just a classic – it’s mum’s best friend. Perfect for collapsing quickly, throwing in the car boot, weighing next to nothing and zipping around, it’s perfect for taking everywhere, every day. 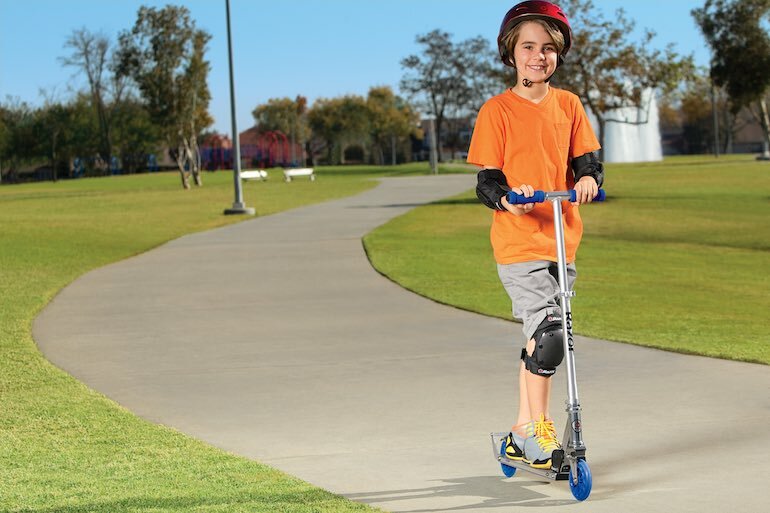 Designed with durability and performance mind, the Kick Scooter will take your child not just from A to B but from five to fifteen years (and beyond). It may look like a tricycle, however this drifting, spinning wicked bundle of fun is anything but! With 360 degrees of ultimate rotating action on dual-inclined caster wheels, this little beauty is a daredevil’s fantasy. Featuring MX-style handlebars with rubber grips, double crown forks, a quality welded steel frame and a high-impact front wheel with a flat-free tire, this feature-packed ride is years of future thrills and excitement. The RipRider is a drifting dream machine for your pre-teen. But be warned, even the smallest and biggest kids in your house will want to try it. It’s actually suitable from five years to 72kg … great news hey Dads?! The Razor RipRider is a whole-lotta-crazy-fun for just $149. Grab your helmet and get ready to let loose, and watch on behlow to see just how this amazing scooter shows just how incredible the RipRider really is! This three-wheeler is all grown up and ready to rock ‘n roll! Easier than it looks, anyone aged five and up can get the Powerwing cranking by shifting their body from side to side. Once you’re moving, add some excitement with 360 spins complete with drifting for funky, freestyle fun! The Powerwing comes in two colours, Red or Sweet Pea, and its unique design means you never actually have to push! This clever scooter comes complete with removable stability bars and has a hand operated front safety brake. The convenient folding mechanism makes it easy to store and dual-inclined casters allow it to turn, slide and accelerate like greased lightning. Freestyle action has never been easier plus you’re guaranteed to be the coolest kid at the park on a Powering! 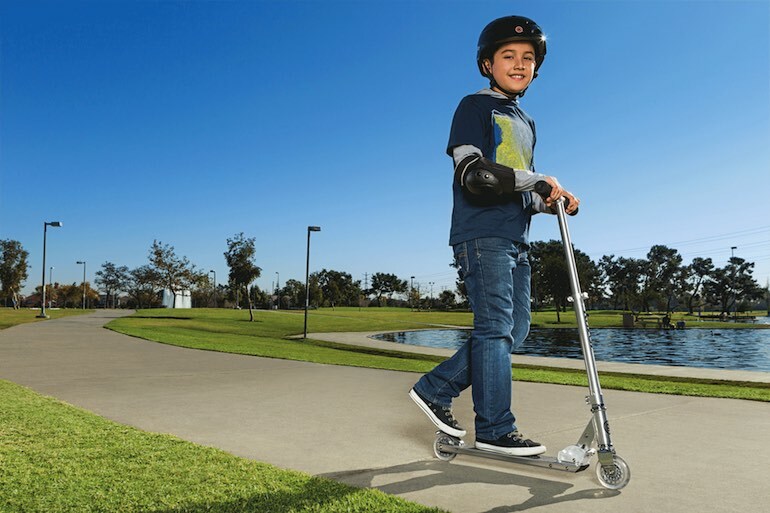 This is the best scooter for kids when you want to mix up the fun from your traditional model and a score at only $129. With almost 20 years in the market, Razor is the scooter brand that Australian mums have grown up with, and now their kids can’t wait to have their own! Designed for both performance, quality and convenience, they’re very cool AND the very best choice when it comes to zip, zip, zipping around. With their popular Kick Scooter a renowned cult-classic, and their endless twists on wheel-based excitement, Razor are the undisputed kings of two-wheeled fun! Scoll down to ENTER TO WIN your choice of the best scooters for kids. Whether you’ve got your heart set on the Razor Classic or the whole range, (yep, it’s possible!) the only way to score them is below! If you’re buying a Razor scooter (of any kind) this month we’ve got great news for you! Save 10% on the Razor Website using the exclusive discount code ‘MUM-10‘. Win Your Choice of Razor Scooters with Mum Central! If you’ve made it this far, you’re clearly ready to win your choice of hot wheels from Razor! Of course, the hardest part is going to be deciding which of these awesome models you want to have in your hot little hands. 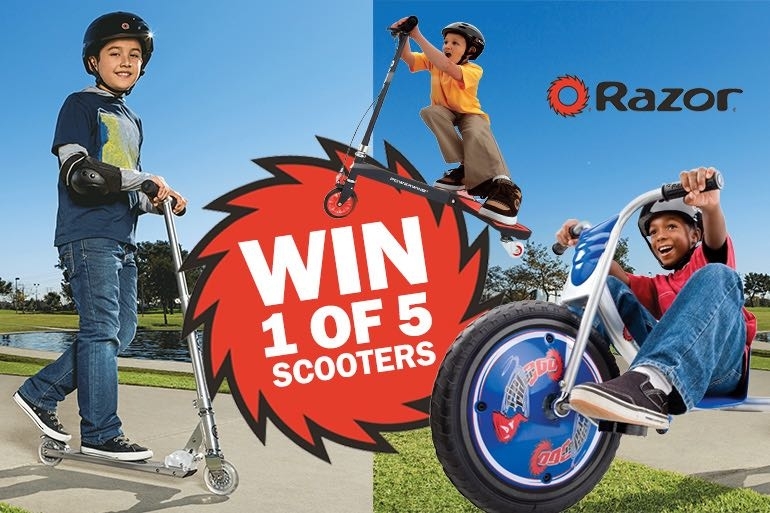 To enter, simply fill in your details below and tell us which of the Razor Scooters you’d like to win. Choose from the Classic to the RipRider or Powerwing – or if you’re feeling bold click them all! From Mum Central to you, good luck! We hope to see you carving up the pavement, real soon! Thanks for an opportunity to win; amazing prizes, good luck everyone! I would love to win this. As each of my children “out grow” it a younger one can have fun with it. Too cool for me but my kids would love to own a razor scooter..
I’d love the Classic for my son! It’d be great to update him from a 3 wheeled Razor scooter to a 2 wheel! My granddaughter would love this prize. She gets excited watching the kids at the skatepark but doesn’t own a scooter. My granddaughter would love this prize. She gets excited when she watches the kids at the skatepark but doesn’t own a Scooter.